I never understand why anyone would buy prepared tomato sauce. It has to be a total hatred of oneself. This is my simple tomato sauce that I use all the time. Its fast and easy and takes only 25 minutes. A general rule: Portions for pasta are 70 grams if you are not very hungry and 100 grams if you are. 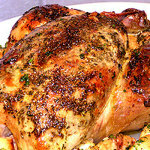 4 Herb Roasted Chicken is a really old classic using fresh herbs I had on the balcony. It takes about 15 minutes to prepare the chicken and 1 hour to cook it. You will love this recipe it’s one of my favorites. 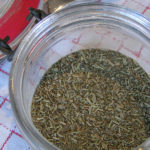 Feel free to use dried herbs I often do just cut the amount by half. A great recipe that can be arranged hours before your guests come. 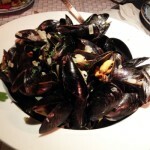 Great as an appetizer, brunch, or a dinner main course. Once your prep is done the whole thing takes about 15 minutes to cook. Everything can be done several hours before you need them if you cover and refrigerate everything. You can do the same with a salad and that leaves you plenty of time for other things.